Milton Brook produce an extensive collection by Pestle and Mortars. 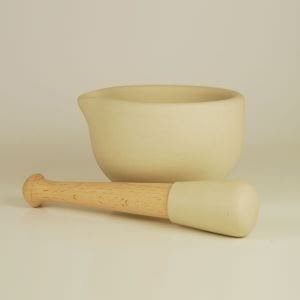 Ideal for grinding and crushing all types of ingredients, this pestle and mortar is made from acid-proof porcelain. Made in Great Britain, each pestle features a wooden handle with a ceramic end, with the mortar featuring a pouring lip. Extremely popular due thanks to a pestle and mortar revival, each one is packaged in an attractive box.